Keep your decks, outdoor dining areas, or pool-side patios shaded with this California Umbrella GSPT 758 PACIFICA Pacific Trail 7 1/2' crank lift umbrella with 1 1/2" stone black aluminum pole. An essential addition to commercial environments, the Pacific Trail series offers umbrellas that are created with superior materials and exude a classic, nature-inspired feel. 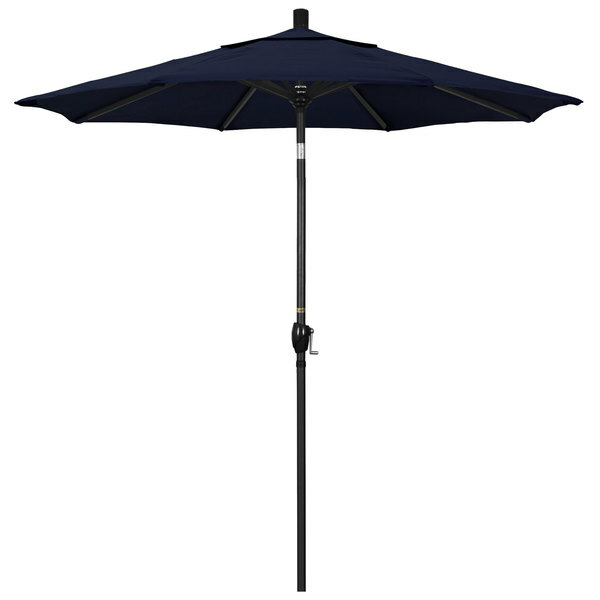 This umbrella features a 1 1/2" thick, double wall stone black aluminum pole for a robust foundation. Its 1/2" aluminum ribs provide excellent support for the canopy. In addition, the single wind vent allows for sufficient air flow to ensure stability and prevent the umbrella from moving with strong wind gusts. This umbrella's area coverage provides multiple guests with relief from the sun's rays. Its crank lift also allows staff members to easily open or close the umbrella with the turn of a crank. In comparison to pulley lifts, this style of lift helps keep the canopy undisturbed in high-traffic areas since it eliminates any hanging rope that could encourage tampering. The canopy's Pacifica fabric is made of solution-dyed polyester that has been perfected to maintain its vibrant coloring. In fact, the strong fiber blend holds its color four times longer than traditional polyester fabrics under the same conditions. It will provide a professional look for years to come. Height (to bottom of ribs): 82"